Some of your client’s may have already, or soon will, call you about the little “pop-up” regarding an “invitation” to upgrade to Windows 10. You can thank Microsoft for this, who quietly included this piece of adware are in the KB3035583 patch release. If you Google “KB3035583 Windows 10”, you will find many articles about this, but from what I have discovered, not EVERYONE will get the notice. I have also read that devices that are joined to a domain, or using an Enterprise SKU will NOT get the invite, so for many of us that may be the saving grace! NOTE: If you are a Go!Manage or VA Hosted partner (K2, VA4), then we have already done this for you! 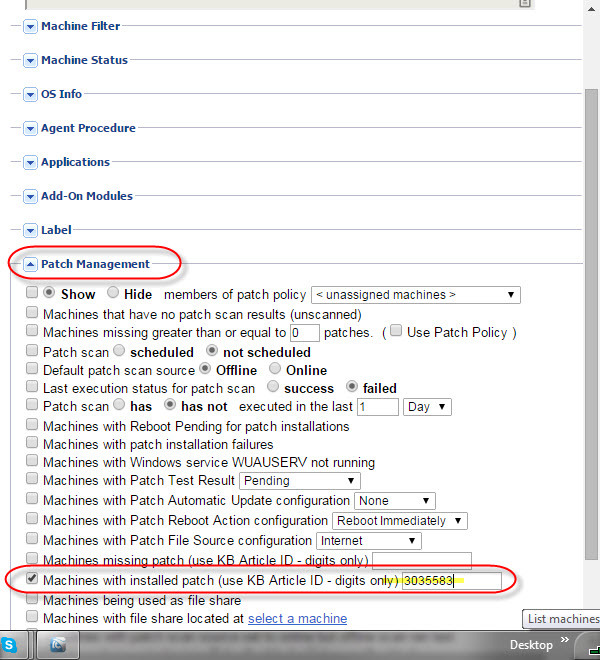 When the View Definition box comes up, click on the “Patch Management” drop down, and check the box next to “Machines with installed patch…), and put the KB number (NUMBER ONLY) in the box, in this case “3035583”. Next go back to the top, and click “Save As”, enter a description for the view (i.e. Patch – KB3035583 installed), and press OK.
4. You can then select this view and see which machines have the patch already installed. NOTE: if you find a bunch of machines that have it already installed, and you have NOT approved the patch, then it is likely that those users still have Microsoft updates turned on and running, OR it could mean the machine is not a member of any patch policy THIS IS A PERFECT EXAMPLE of why you want to CONTROL Microsoft Updates!!! !